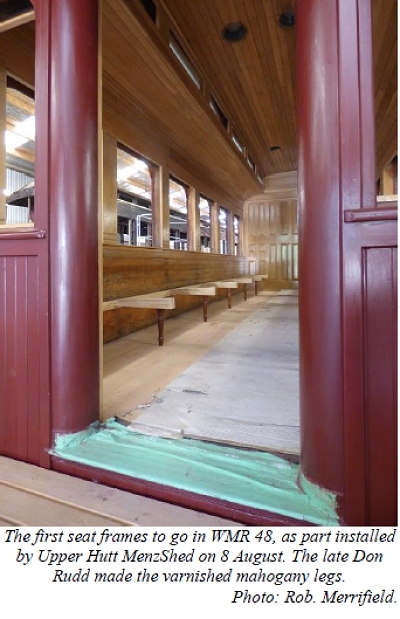 Inside the carriage MenzShed Upper Hutt have been helping us by making the frames for the seats. These are being fitted inside No. 48 September-October 2018. We have raised the funds from donations and grants to allow us to have the seats upholstered once the frames are complete. Also on site are WMR carriages 52 and 42. All were built as second class carriages by the WMR at its Thorndon workshops. No. 42 was built as part of the first batch, in 1905; No. 52 in 1907. No. 42 had an end toilet, unlike the other two which were built in a subsequent batch with a central toilet compartment. These are the last surviving complete WMR carriages. Donations towards the cost of materials and services are appreciated and welcomed as we move towards completing No. 48. Much of the remaining work is specialist outwork that we cannot do in our own workshop and have to pay for. Examples of further such needs include the many small castings required to fully fit up windows and doors, also sign writing and the making of reproduction interior lights.